Yantrodharaka Hanuman temple in Hampi is one of the famous temples in India. Here you can see the statue of Lord Hanumaan inside Yantra. Hence it is named as Yantrodharaka. 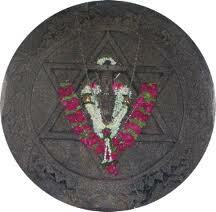 Here is an interesting story behind this yantra and temple. Sri Vyasathirtha, a great scholar saint during the reign of King Krishna Deva Raya is believed to be an incarnation of the celestial Shankukarna. The earlier incarnation of Shankukarna was Bhakta Prahlada and the one after Sri Vyasathirtha was that of Sri Raghavendra Swami. Sri Vyasathirtha used to go to very calm spots on the banks of river Tungabhadra and meditate uninterrupted. 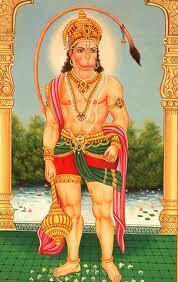 One day, while he was meditating in a hillock near Chakratirtha, an image of Lord Hanuman kept coming to his mind. This happened only at that particular spot and nowhere else, even in nearby hillocks. Sri Madhwacharya (believed to be an incarnation of Lord Hanuman) appeared in the dreams of Sri Vyasathirtha and instructed him to install an icon of Lord Anjaneya (Hanuman) next time. The next time Sri Vyasathirtha saw the image in the middle of his meditation, without any delay, he drew the image from his mind on to a rock using an Angara (coal used by Brahmins during Pooja performance). To his surprise, a monkey came to life from the rock and jumped out of the rock and his drawing would disappear. He repeated the process of drawing and every time, a monkey would jump out of the rock and the drawing would disappear. This happened 12 times. Full of surprise, Sri Vyasathirtha finally decided to bind the image of Lord Hanuman in a Yantra. A small temple was built there and hence the temple has the name Yantroddhara Anjaneya. In the core of the Yantra is the statue of Lord Hanuman in Padmasana position. This is probably the only temple of Lord Hanuman in a sitting position which is generally in a flying or blessing position. The Yantra here is a form of binding which looks like a 6 cornered star. The star is encircled in a circle with flames going outwards giving it the drawing look of a sun. A closed, benzene like ring of 12 monkeys holding each others’ tails can also be found around the star and the sun which forms the outermost structure of the Yantra. Following this, it is believed Sri Vyasathirtha installed 732 Hanuman temples all over South India. It is, to date, very difficult to get a list of all these. Even to this day, the temple is a very sacred place and many people visit it everyday. Many monkeys can be found in and around this temple. They are harmless as long as nobody disturbs them but if you decide to offer coconuts or bananas at the temple, be careful because the monkeys might decide to nick them from your baskets.